In a major development Turkish authorities have claimed of obtaining audio and video recordings proving that Saudi dissident journalist Jamal Khashoggi was interrogated, tortured and killed in the Saudi consulate where he was last seen on October 2. 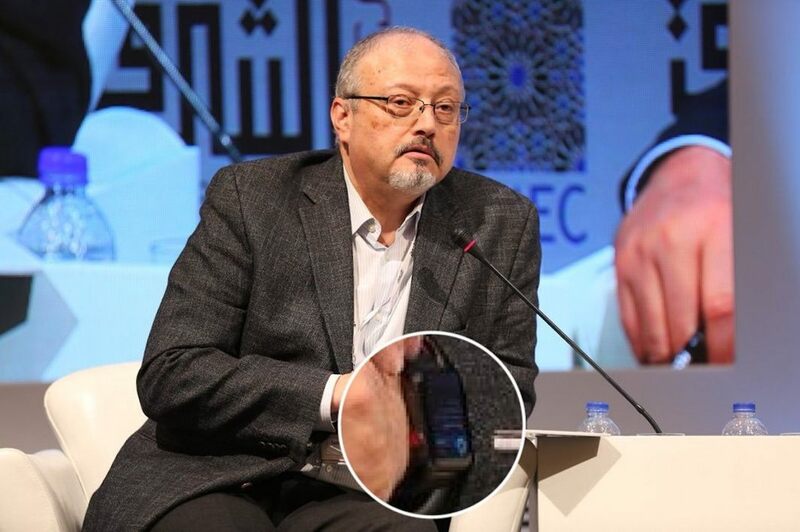 Sabah, a Turkish daily said on Saturday, “The moments when Khashoggi was interrogated, tortured and murdered were recorded in the Apple Watch’s memory.” The watch was synced with his mobile phone which he had left with his fiancée Hettis Cengiz waiting outside the consulate. Meanwhile US President Donald Trump, according to CNN, says he doesn’t want to cancel the $ 110 billion defence contract, he brokered last year, with Saudi Arabia last year. Saudi Arabia hosted summit of Muslim countries facilitating Trump’s meeting during his maiden foreign visit to Saudi Arabia in May last year as well. However, in a related development Saudi Arabia has not extended permission to Turkish police to enter into the Consulate building, which was earlier committed by Saudi Crown Prince Mohammed Bin Salman. Instead, due to some obvious behind the scene development, Turkey has accepted Saudi proposal of having joint team of investigators. A delegation from Saudi Arabia has arrived in Istanbul for the proposed joint investigation into Khashoggi’s disappearance. Saudi Press Agency, the official news agency, carried a story quoted government source, welcoming Turkish decision to agree for the joint investigation. Earlier, Turkish President Recep Tayyip Erdogan had vehemently demanded from Saudi authorities to provide the video footage supporting their claim of Jamal Khashoggi’s departure from the consulate. Previously, two senior Turkish officials told that the ill-fated journalist had been wearing a black Apple watch when he entered the consulate. However, the Turkish daily say that it was not clear whether data from Khashoggi’s watch could have been transmitted to his phone outside, or how investigators could have retrieved it without obtaining the watch. The daily which cited “reliable sources in a special intelligence department” for its report, said Khashoggi was believed to have turned on the recording feature on the phone before entering the consulate. He went to the consulate for obtaining some document before marrying his fiancée in Istanbul. It is reported that Saudi intelligence agents, who especially flew in for the operation, had realised after Khashoggi died that the phone was recording and they used his finger print to unlock it, deleting some files, but not all of them. Turkish security sources, speaking on condition of anonymity, said the initial assessment of the police was that Khashoggi had been deliberately killed inside the consulate. On Friday, Saudi Arabia’s interior minister Prince Abdulaziz bin Saud bin Naif condemned the “lies and baseless allegations” against the kingdom, although he praised the joint investigation with Turkey. ▫️Wall Street Journal: When Jamal Khashoggi left Saudi Arabia last year, Saudi officials asked him to return. He declined, fearing it was a trap !